Follow my family and I as we spend the next year surviving on one income without using our credit cards! Is this even possible for a family of four in today's recession? Follow along and find out. I'll also be checking out businesses run by mamas, the latest and greatest for kids, as well as just being real about motherhood! We did it! We have paid off our final loan leaving us with only a car payment and mortgage. I'm readjusting our monthly payments so that I can increase the amount we are putting towards our car. We are still on bi-weekly mortgage payments as well so we've now made (as of this month) an extra payment this year. I hope to get our mortgage down as much as possible so that we can consider refinancing without having to pay any fees, etc. We have managed to go another month on cash alone. As time goes on I find that I am dipping into our savings a lot less, replenishing accounts more, and paying off the last bit of debt we had prior to starting this challenge. My hope is that this next paycheck will pay off the loan and we will be on our way to paying off our car! My goal for that payoff is August 2011 leaving us 1 year shy of our 4 year loan. After that, I will be working towards increasing our retirement savings, kid's college accounts, and paying off our mortgage. My ultimate dream goal is to pay the house off in the next 10-12 years, and I believe that with some determination and organization, we can do it. I want to make sure we are investing correctly in our retirement accounts as well without sacrificing the here-and-now. You see, I don't want to end up saving so much that I don't get to enjoy my children, some last minute trips or even an occasional date-night-out. It is such a delicate balance. I've found myself frustrated with couponing as well. As much as I find it beneficial it is such a challenge to have enough coupons to make the trips worthwhile- that is, of course, my experience. I need to get back on track and reorganize my coupons. I have also noticed that I was buying things I didn't necessarily need simply because I had a coupon. Those coupons are so tempting... you buy something then you've created a need for an item you didn't quite have in your life before. For example, I never bought Juicy Juice, but I got a great deal. I had them in the house for weeks and it was so easy to whip one out as a "treat" for my son. Once they ran out I was almost tempted to buy some until it dawned on me that we were just fine before without them. Hence the magic of coupons! Anyone else set up any goals while I've been away? I would love to hear about your savings tricks, obstacles, thoughts... anything. Come keep me company or this will be a long year! Well, I took some time away from the blog in the hopes that I might come back rejuvenated. In the time that I was away, we managed to stay away from the credit cards, use cash only or debit for everything, increase our monthly contribution to our car payment (paying an extra 50% more than what is required), and pay off 60% of the amount due on our remaining loan. I'm excited that we're finally getting somewhere with our payments. I've noticed a big difference in my spending habits as well. It seems my husband is still somewhat adjusting to living life on cash, but as time goes on I think he is slowly coming around. The benefits are currently immeasurable. Not only have we learned how to better handle our finances, but we are staying debt-free which is in and of itself the biggest benefit to this whole experiment. We've managed to also create a savings account for Junior that we hope to increase once I go back to work. These are all of the updates I have for now. I will keep you posted as time goes on. For now, I hope you guys are trying to save a few pennies here and there. I can promise you won't regret it. Anybody have anything they would like to share? I would love to hear your experiences. You will see the charge appear as a pending charge on your account then, after you return the DVD, it will drop off. Sorry I didn't post this sooner, but a winner was drawn on August 31st. Congratulations to our winner. I hope you guys make it back here in the future for other giveaways. Thank you for taking part and thank you to Easier Said Vinyl for sponsoring such a fun prize. Don't forget to check out her site! The discount ends this Tuesday! The "W" coupon is still available (check out the article I posted about the Amazon diaper deal.) If you place an order worth at least $15 through Easier Said Vinyl by tomorrow, I will give you a 20% off coupon for Amazon.com. The beauty of this coupon is that it can be stacked on an order of diapers and is worth approximately $7 so add that onto the 10% discount she has going and you're getting a great deal! Now get shopping. So, I am enjoying putting this site together. I hope I've been able to drum up some business for those involved in the giveaways, I like finding deals, and the accountability of publicizing my credit card adventures has kept me on track, however, I feel like I am alone here. I found a wonderful website that connects other mom bloggers, and although at first I was very excited about this, now I realize that my number of followers is up but my audience is still absent. I guess it takes time to develop loyal readers those who will comment on articles, keep you honest, and spark ideas. I feel like I've reached that point where I am looking to take this to the next level. I'll have to think about this one and get back to you all. Quick money update here. Things are going well. Having extra income is helping out and we've almost reached our goals because of it. Not too much longer. I have gotten several cake orders so that seems to be promising. I'm looking forward to putting those together. I hope they are what my customers were anticipating and more. Honestly, not much else to report. We're on track, have a couple of bimonthly payments due, and we hope to work towards our car payment next. We looked at bidding out the contract work on our basement, but I think it might take us a few YEARS to save up for that... expensive. $4 movie tickets through Groupon! you can get $4 movie tickets for use at participating Fandango theaters (retail value is $12 per ticket.) Great deal!! Take advantage. Use the code "UTAKE20" today (Fri) and tomorrow to get an extra 20% off of everything at Kohls.com! Use code "EED241" at the JoAnn Fabric site and you will get 40% off of one item. This coupon expires on Sunday, August 29th. Now through September 1st use promo code "LUCKY49" and you will free shipping on your orders over $49 at JcPenney's. 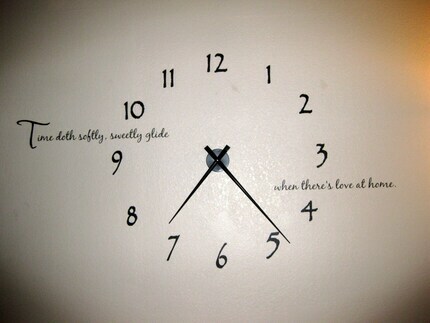 I have always loved these wall clocks. They are a great way to fill a wall space in a room without spending a fortune yet making a practical use out of the space. Easier Said Vinyl has them available and I am so tempted to get one for my living room. What do you all think? I've seen them in the stores for the same price or more, but what I like about hers is that I can customize it to suit my space. I can change the font, color, expression, etc. which I can't do with a store bought clock. Have you guys made it over to her store? Check out her product line at Easier Said Vinyl. Spread the word by following me! "You're the best little brother in the roll." Said by my 3 year old to his baby brother. Too sweet. Was your shop featured on MIM? Grab a button! Love what you see? Grab a button! Check out Mylikes by clicking here It is a website where you can share what you like in your area as well as find out what other people like nationwide. It's a new members-only site where everything is free and you can get some cool stuff without spending any money. You give away the things you no longer need, and get things you want for free. It's all done using free credits instead of real money. Most people start with 100 credits, but this invitation gives you 150 to get more when you start. Sign up here. Do you Tweet? Get paid to do so! Earn money from the comfort of your home all by letting the world know what you like! Check out My Likes to see how easy it can be to get started. Seriously so easy to set up! Mommy 2010. Simple theme. Theme images by UteHil. Powered by Blogger.